Me: "Oh I am so ready for the kids to go to bed tonight." Him: "How many have you had today?" Me: " Just our two." Him: "I was actually talking about bottles of wine." The seaweed curtain we made yesterday for E's birthday party. I'll give you the instructions for it at a later date. Today is the last day of the school holidays here in New Zealand. Much as I love my children and really enjoy having all their friends over to play (seriously, I really do! ); there is only so much picking up of toys; picking glitter-soaked glue off the upholstery and breaking up of fights over who gets to hold the very tolerant cat that a person can take. I'm sure you are nodding right now. E making a fish for the school of fish we are planning on hanging from the ceiling. If you are new to the parenting game, I highly recommend that you start making friends with other people with similar aged kids as soon as possible and set up an informal swapsies arrangement with them during the holidays so you can get a break from the inevitable bickering that breaks out when the kids spend too much time together. I am lucky enough to have a wonderful group of girlfriends with similar aged kids and our children have been all around the different houses all holidays. One of them took my oldest daughter all day and night when the youngest was sick earlier in the week. You don't have to ask with friends like that. They just know what you need and when you need it. Wonderful. I am looking forward to the holidays being over and the kids being back in their routines (and me in mine) but I also don't want them to end because my baby is turning 5 and will be starting school. Her party is on Monday so we've been busy getting ready for the big day. The entire kitchen table is covered in fish shapes and glitter today whilst the kids finish off making the school of fish we are planning on hanging from the ceiling. Maisy decided she was joining in the kids game of zoos. There's a paper mache fish shaped pinata in the oven (it's been so damp here, it's just not drying so I decided to give it some help today!) and my house generally looks like a complete tip. My parents are arriving this afternoon from Australia and I haven't even thought what I'm going to cook for them for dinner or done the shopping for their favourite foods that I like to get in. I think I am going to dig out the trusty slow cooker, take the kids to the shops and playground and try not to panic! 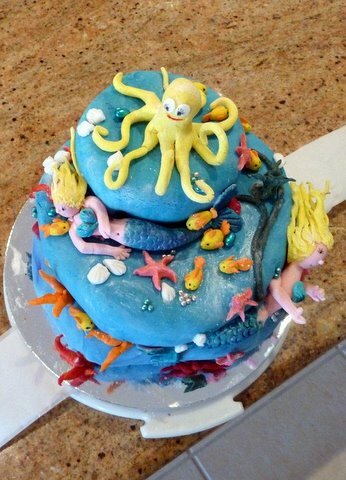 There's definately one thing I don't have to worry about and that's the cake. 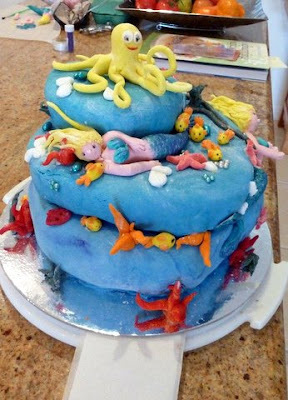 My amazing Mum has made a mermaid cake for E. Have a look at this! Isn't it beautiful and everything a little girl having a mermaid party could wish for? This big girl certianly loves it. My only concern (that some of you may have picked up on already) is that she made it in Australia and is therefore bringing it over on the plane. Keep your fingers crossed that it arrives in one piece! !